These 10-Ply trailer tires have a high load capacity. It is unlawful to mount a trailer tire with a load capacity that is higher than that of the wheel it's being mounted to. This tire can only be mounted to trailer wheels rated equal to or greater than 1,520 lbs. This means that this tire cannot be mounted to a 4-lug wheel because the load capacity of 4-lug wheels is not high enough. ST145/R12 Tires are a radial, 12 inch trailer tire. They come in a variety of load ranges, Load range C, D, and E.
The size can be read in a few different ways, 145R12 , ST145R12, or ST145/R12. 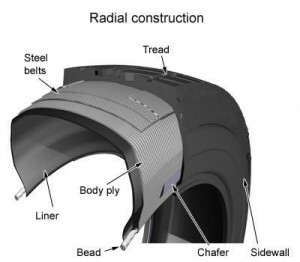 These radial 12" tires use the same size rim as a 4.80x12 or 5.30x12 tire. This tire commonly uses a 4" wide, 12" wheel (12x4). Usually a 12x4 or 12x4.5 wheel is used. They carry a load of 1520lbs per tire when filled with 80PSI of air. allowing more tread to meet the road. You are eligible for the benefits of this warranty (the "Limited Warranty) only if you are the original owner and consumer of new GLOBAL TRAX trailer tires. Such tires bear the original Department of Transportation (DOT) - prescribed tire identification numbers, and such tires are on the trailer upon which they were originally installed according to the trailer manufacturer's recommendations. Subject to the limitations contained in this Limited Warranty, your new GLOBAL TRAX tires are warranted under this Limited Warranty against failures due to defective materials and workmanship for a period of Three (3) years of from the date of tire manufacture or two (2) years from date of purchase, whichever occurs first. Tire manufacture date is determined by the Department of Transportation (DOT) - pre¬scribed tire identification numbers. A. Eligibility: A tire is eligible for warranty coverage under this Limited Warranty only if the tire is presented by the original owner and consumer within Three (3) years of the tire manufacture date or two (2) years from date of purchase, whichever occurs first, the tire has a minimum of 2132nd inch of tire tread depth remaining, and all procedures in this Limited Warranty are followed. C. Tread wear Prorated Discount: A defective tire that does not qualify for free replacement under (B) above, but that is otherwise eligible for warranty coverage under this Limited Warranty, will entitle you to a discount on the purchase of a new comparable GLOBAL TRAX tire. The amount of the discount will be calculated based upon the percentage of tread that remains on the defective tire. For example, if 60% of the original tread remains on the defective tire, you will be entitled to a 60% discount off of the retail price of a new comparable GLOBAL TRAX tire. You are responsible for all labor costs for mounting and balancing and for all applicable taxes. 1. Damage, failure, or irregular or premature tread wear caused by, resulting from, arising out of fire, accident, chemical corrosion, malicious mischief, vandalism, or road hazards. Example of road hazards include, without limitation, nails, glass, rocks, curbs, and other foreign objects and natural and man-made obstructions or obstacles such as excavations, construction, potholes, and chuckholes. Damages caused by road hazards can include, without limitation, cuts, snags, punctures, scuffs, carcass bruises, and impact breaks. 2. Damage, failure, or irregular or premature tread wear caused by, resulting from, or arising out of improper operation or maintenance such as, without limitation, misappli¬cation, neglect, misuse, running flat, overloading, under-or-over inflation, excessive speed, improper installation, improper wheel alignment, improper mounting or dis¬mounting, use of puncture sealants, tire plugs, or fillers, noncompliance with safety, usage, or maintenance instructions or parameters, or any alteration to the tire such as, without limitation, grooving bead or sidewall decorative material or the addition of a white inlay (whitewall) to any tire. 4. Loss of time, inconvenience, loss of use of the trailer, costs of towing or transportation, and/or incidental or consequential damages of any type or nature including vehicle or trailer damage. A "comparable" new GLOBALTRAX tire may either be the same line of tire or, if the defective tire is out of production or unavailable, a tire of the same basic or equal construction and quality with different sidewall or tread wear configuration. If a higher priced tire is accepted as replacement, you will be responsible for the difference in price. Tread wear is computed as a percentage of the original usable tread. The original usable tread does not include the last 2-32nds of an inch of tread depth. RECSTUFF shall make all determinations regarding tread wear and eligibility for warranty coverage under this Limited Warranty in its sole discretion. Defective tires qualifying for coverage under this Limited Warranty will be replaced either at no charge or at a discount in accordance with the terms of this Limited Warranty. In order to claim under this Limited Warranty, you must present the allegedly defective tire to any GLOBALTRAX Tire Distributor or participating dealer in the USA or Canada. To obtain a no charge adjustment for tires, you must present proof of purchase date (such as trailer dealer or tire retailer invoice). You are responsible for payment of all taxes, as well as retailer charges for services that you request but are not covered by the warranty. This warranty gives you specific legal rights and you may also have other rights which vary from state to state. If there is no GLOBAL TRAX Authorized Tire Dealer in your area, you must call (888)728-1650, 9AM-4PM Central Time, weekdays for instructions regarding the allegedly defective tire. RECSTUFF may require that the tire be delivered by you, freight prepaid, to RECSTUFF directly or to a specified GLOBALTRAX Authorized Tire Dealer or other party designated by RECSTUFF. Except as noted in this Limited Warranty and unless otherwise provided by law, THERE IS NO WARRANTY OF MERCHANT-ABILITY, FITNESS FOR A PARTICULAR PURPOSE, CLEAR TITLE, NON-INFRINGEMENT, OR ANY OTHER WARRANTY EXPRESSED OR IMPLIED. This Limited Warranty is the entire warranty given by RECSTUFF and RECSTUFF complete obligation is as set forth herein. No one has the authority to imply, suggest, agree, represent, warrant, or promise contrary to the terms hereof. REPLACEMENT OF A DEFECTIVE GLOBALTRAX TRAILER TIRE AS SET FORTH HEREIN, EITHER AT NO CHARGE OR AT A DISCOUNTED CHARGE, AS APPLICABLE, CONSTITUTES THE SOLE AND EXCLUSIVE OBLIGATION OF RECSTUFF AND THE SOLE AND EXCLUSIVE REMEDY AVAILABLE TO YOU IN THE EVENT OF BREACH OF ANY WARRANTY OR OF ANY AGREEMENT BETWEEN YOU AND RECSTUFF OR ITS AUTHORIZED DEALERS. 1.) Check air pressure monthly when tires are "cold". Use an accurate tire air pres¬sure gauge. Do not reduce pressure when tires are hot. Proper inflation is essential. Underinflation produces flexing of sidewalls and builds up heat to the point that pre¬mature tire failure may occur. Overinflation can cause the tire to be more susceptible to impact damage. 2.) Never overload your tires. The maximum load capacity and maximum inflation pressure are molded into the sidewall of your tire. Overloading builds up excessive heat and can lead to early tire failure. 3.) Avoid damaging objects (potholes, glass, rocks, curbs, etc.) which may cause internal tire damage. Continued use of a tire that has suffered internal damage, which may not be visible externally, can lead to dangerous tire failure. Determination of internal damage will require dismounting of the tire and examination by trained tire personnel. Improper tire mounting and inflation procedures may cause the tire beads to break with explosive force during installation of the tire on the rim. Tire and rim must match in size. Rim parts must match by manufacturer's design. Clean rim. Lubricate rim and beads. Do not exceed the maximum recommended pressure to seat the beads. ONLY SPECIALLY TRAINED PERSONS SHOULD MOUNT TIRES. Use of worn out tires (less than 2-32nd" remaining tread depth) increases the probability of tire failure. Excessive speed creates heat buildup in a tire, leading to possible tire failure. LIMITATION OF LIABILITY IN NO EVENT SHALL RECSTUFF OR ITS AUTHORIZED DEALERS OR DISTRIBUTORS BE LIABLE FOR ANY INCIDENTAL, INDIRECT, SPECIAL CONSEQUENTIAL, PUNITIVE, OR EXEMPLARY DAMAGES OR LIABILITIES (INCLUDING, WITHOUT LIMITATION, INCIDENTAL OR CONSEQUENTIAL DAMAGES FOR LOSS OF TIME, INCONVENIENCE, LOSS OF USE OF TRAILER, TOWING, ROAD SERVICE, OR ANY OTHER CONSEQUENTIAL OR INCIDENTAL LOSS) IN CONNECTION WITH THE PURCHASE, USE, OR OPERATION OF THE TIRE, WHETHER DUE TO A BREACH OF WARRANTY, BREACH OF CONTRACT, OR OTHERWISE, EVEN IF RECSTUFF HAS BEEN ADVISED OF THE POSSIBILITY OF SUCH DAMAGE. NOTE: SOME STATES DO NOT ALLOW THE EXCLUSION OR LIMITATION OF INCIDENTAL OR CONSEQUENTIAL DAMAGE OR IMPLIED WARRANTIES, SO SUCH EXCLUSION OR LIMITATION MAY NOT APPLY TO YOU.